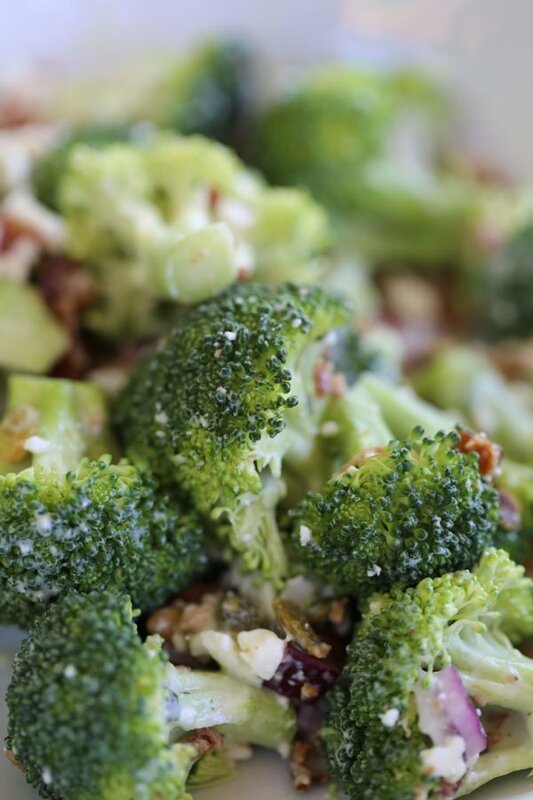 Cold Broccoli Salad is a delicious summertime treat. Really, this can be enjoyed year around, but it is especially refreshing when the the heat outside turns up. 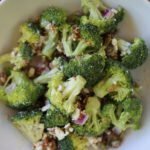 Broccoli Salad with bacon is one of my favorite ways to eat broccoli. 🙂 Bacon added to anything makes it delicious, to be honest, but the combo with broccoli really is fantastic. Freshly cooked bacon would be ideal, but I used a bag of bacon pieces, and it was perfect. I will also make this recipe more knowing I can use the bacon pieces. Just to be clear, I am referring to the Hormel real crumbled bacon that you refrigerate, not the dried shakers of bacon. As I’ve mentioned before, I’m in love with greek salads and always enjoy the red onion. 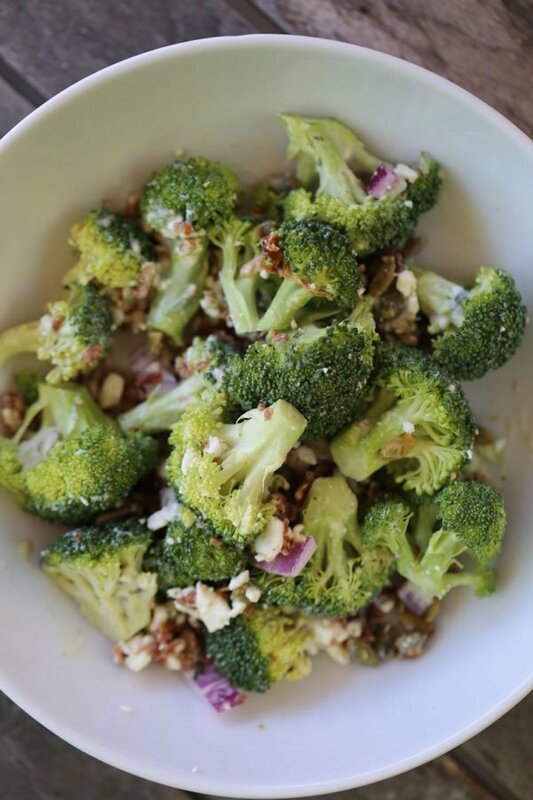 The red onion mixed with broccoli and creamy dressing is perfect. This is a dish that has endless variations. I’ve made it before with raisins, walnuts and several different types of dressings. 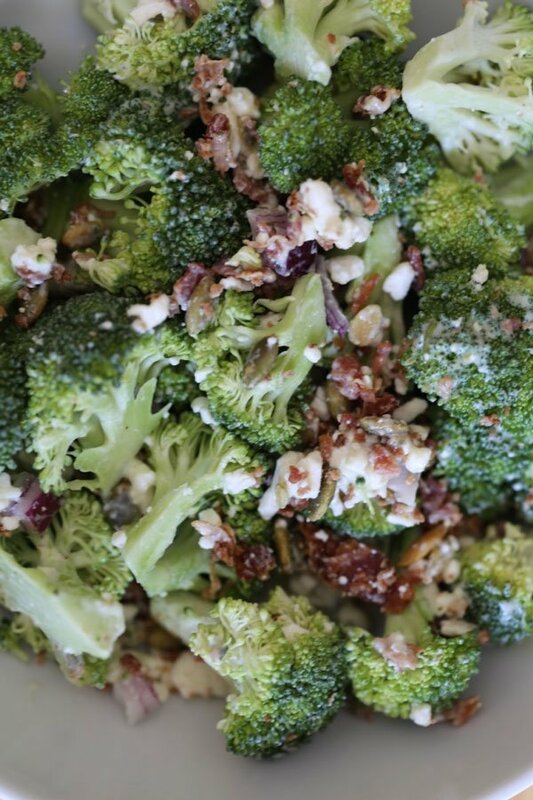 However you make it, this is an exceptionally delicious way to include broccoli in your diet. Salad dressing of your choice. I used creamy cilantro avocado yogurt dressing this time. I have also used Greek Goddess dressing from Trader Joe's in the past. Something creamy and savory works best for this one. Chop head of broccoli into bite sized pieces. Combine rest of ingredients with broccoli and toss.